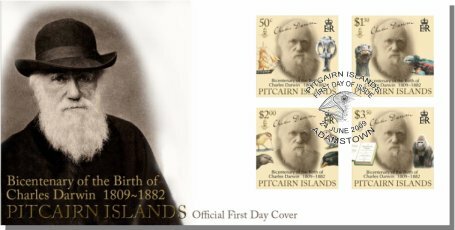 2009 is both the 200th Anniversary or bicentenary of the birth of the greatest naturalist in history, Charles Robert Darwin, and the 150th Anniversary of the publication of his most famous work “On the Origin of Species by Means of Natural Selection”. 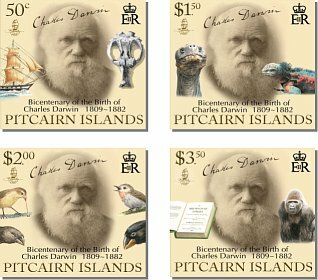 Born in Shrewsbury, Darwin studied at Edinburgh University and Christ’s College, Cambridge, before embarking at the age of 22 on a five-year journey to South America, the Galapagos Islands and beyond, aboard the HMS Beagle. At this time, most Europeans believed that the world was created by God in seven days as described in the Bible. On the voyage Darwin read Lyell’s “Principles of Geology” which suggested that the fossils found in rocks were actually evidence of animals that had lived thousands or even millions of years ago. The animal life and geological features that he saw on the voyage reinforced Lyell’s argument and Darwin linked the fossils to modern species. Evolutionary change was gradual, requiring millions of years. The millions of species alive today arose from a single original life form evolving through a branching process called ‘speciation’. Darwin’s theory of evolutionary selection holds that variation within species occurs randomly and that the survival or extinction of each organism is determined by that organism’s ability to adapt to its environment. This theory of evolution by natural selection underlies all modern biology.